Sandra Kuck describes herself as a "romantic realist." Her nostalgic settings and angelic children evoke memories and emotions of childhood, or of our own children and grandchildren. The vibrant color, delicate lighting, and peaceful atmosphere captures the beauty and simplicity of days gone by. 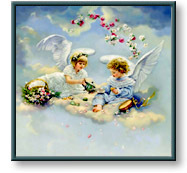 Heavenly Tea is one of three prints in the Heavenly Series, released in 2000. Please add $7 for shipping & handling. Heavenly Tea copyright © 2000 by Sandra Kuck is prohibited from being copied.